No one wants to go gray, as is it a sure sign of aging, so spotting that first gray or white hair can be upsetting for most people. Although many folks expect to start seeing some gray strands once they hit their early 40’s or 50’s, for those in their 20’s and 30’s, finding even one gray or white hair can be a major blow to one’s self-esteem and confidence. The good news is, there are many ways to prevent and treat prematurely graying hair. Here are some natural ways to stave off those gray strands and improve your hair’s health, too. Medical Conditions: Diseases like hypothyroidism, sinusitis, anemia, neurofibromatosis, tuberous sclerosis and chronic colds can lower melanin. Heredity: This is a major cause for many people, but there are still things they can do to prevent or at least slow down the graying. Emotional Problems: Chronic stress, depression and anxiety can take their toll on many areas of your body, including your hair. Poor Nutrition: A lack of vitamin B, iodine, copper and iron can lower melanin. Hormonal Fluctuations: Pregnancy and menopause may cause a drop in your melanin, leading to graying. Unhealthy Lifestyle: Making poor choices, like eating junk food, as well as smoking and drinking excessively can reduce melanin. Hair Dyes and Synthetic Products: The use of poor quality, chemically-laden hair products can damage your hair and prevent melanin absorption. 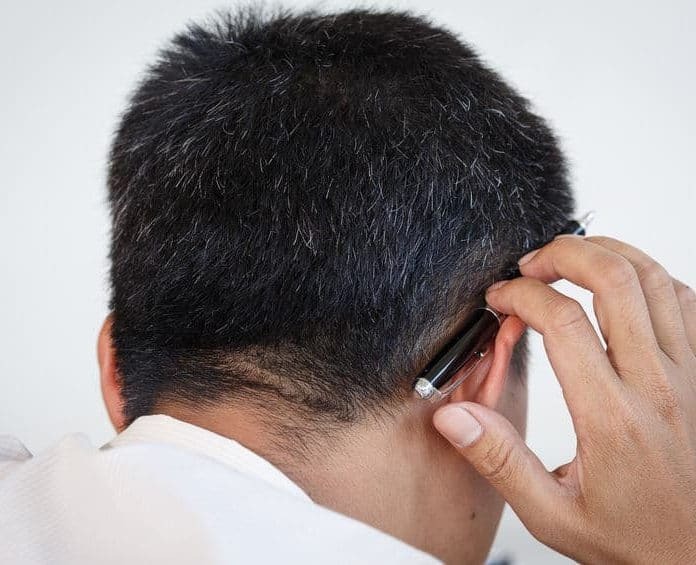 Most people think there is nothing they can do to treat graying hair, but there are a variety of ways to approach this problem, both inside and out. Start from the inside of your body with some simple yet healthy lifestyle changes. Eat healthy foods, get lots of exercise, address your stress and get an ample night’s sleep. Quit unhealthy habits, like smoking and drinking excess alcohol. Phyllanthus Emblica, Amla or Indian gooseberry is one of the most well-known home treatments for gray hair. In fact, people have used it in Ayurveda for centuries to address a host of hair issues because it is a rich source of vitamin C, an antioxidant that keeps hair healthy and prevents premature graying. Amla Juice: You can drink it as a beverage for better health and slow the production of gray hair. Amla Oil or Pulp: Just apply it to your hair and massage gently. You can add a tablespoon of lemon juice to a tablespoon of amla oil, as well. Leave it on overnight and shampoo it out of your hair in the morning. Amla Powder: You can dry a few pieces of Indian gooseberry in the sun or in a low oven temperature, and then grind them into a smooth powder. Amla powder can be added to a variety of hair products to add volume and shine. Amla and Coconut or Almond Oil: This mixture can add some color to your hair, as well as nourish and moisturize your scalp. Just take Amla powder and mix with your oil of choice. Apply it to your scalp on a regular basis to treat gray hair. Hypertension: Amla can lower blood pressure, so if you are already taking medications for it, consult your doctor before trying amla. Stomach Problems: Too much of the vitamin C in amla can cause stomach problems like cramps, diarrhea and acid reflux, so if this occurs after consuming it, cut down or stop using it. Scalp Dryness: Too much amla usage can lead to scalp dryness, dandruff and flaking, so to prevent this, be sure to consume lots of water, as well. Allergies: Skin reactions can occur from amla allergies, so if you notice your skin turns red or is irritated, or you feel dizzy or have a headache, be sure to stop taking it right away and call your doctor.